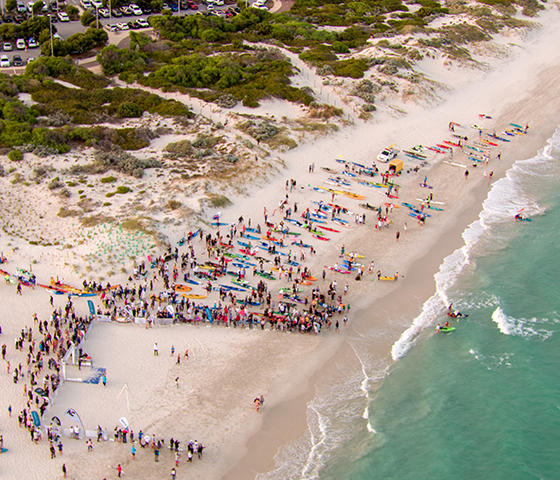 Rottnest Express is again a presenting sponsor of the Hotel Rottnest Port to Pub swim. A legacy sponsor of the event, Rottnest Express will once again be providing extra ferry services for those travelling to and from the event, including ferries late into the night to get you home safely if you’re not staying on the Island. This New Year, make a Rotto resolution that will be easy to keep -swim in the Port to Pub and then visit Rottnest Island over and over, with a Rottnest Express Red Rider multi-trip pass! For a limited time only, West Australians can enjoy up to 10 adult return ferry trips per year to Rottnest Island for $129! So the next time you want a summer dip at Little Parakeet Bay, an autumn stroll to the Lighthouse, a winter warmer at the Hotel Rottnest or perhaps a springtime bike ride with ocean views, the Red Rider pass will get you there – any day, any season. Enjoy the freedom and flexibility of a Red Rider pass to make the most of the pristine wilderness on your doorstep for both same-day trips or extended stays. Rottnest Express operates more ferries, more often, including the only direct connection available from Perth to the island. Step on board at Perth or Fremantle to enjoy the fun and hospitality of our local crew who are only too willing to provide their expert advice on how to make your Rotto outing a memorable one. For the kids, don’t forget to sign up to Rottnest Express’s Quokka Club for free ferry travel year-round. Western Australian kids aged 4 to 12 years old are invited to register for Quokka Club. Those under 4 years already travel free with accompanying adults. All Quokka Club members will receive a special passport to use for travel and to redeem for great discounts while on Rottnest Island. Summer fun awaits you at Rottnest Island!